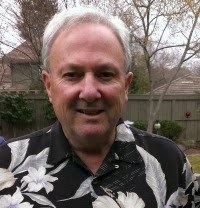 www.fromatravellersdesk.com: Michael Johnsen of California U.S.A. Pops advice to you when travelling to Europe is to arrive in the closest and cheapest airport and you can go from there. Flying around in Europe with Ryanair is cheap, the same way with AirAsia in Asian countries. Why is Xi’an my favourite city to visit in China? four ancient capitals. It could be the fact that it is the start of the Silk Road. It could be the beautiful Drum and Bell Towers in the centre of the city. Although these are all awesome to see, my reason is a very simple one. It is the wall. I have been to Rome and other cities that were once enclosed in a wall. You can still see parts of the walls here and there but not the entire wall. 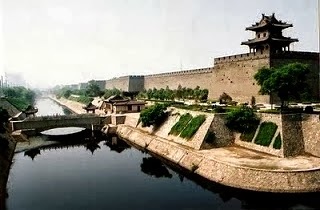 The ancient city of Xi’an was enclosed in a wall for protection and the wall is still intact and in use. The wall is 40 feet tall, 40 to 46 feet wide at the top and 50 to 60 feet wide at the base. The length of the wall is 8.5 miles. There is also a moat on the outside of the wall. There are massive gates at the 4 sides of the wall in entering the city. Now cars and buses are seen driving in and out of the city gates. 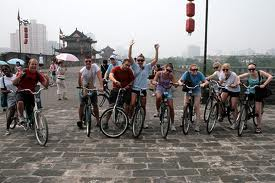 For a cool fact about the wall, the best way to see the city is from the top of the wall riding a bicycle. You can rent them at the top of the wall. Being about 40 feet wide it is very safe and you can ride all the way around the 8.5 miles or ride for a while and turn back if 8.5 miles is too far. Any way, you are 40 feet tall and get an incredible view both inside and outside the wall. When I did it, some teenagers passed me who were speaking English. When I asked them where they were from they said New York. If you can’t ride a bicycle then someone can peddle you around in a 3 wheel bicycle that seats 2 people. Riding the wall is a must do experience. I stayed at the Sofitel Hotel in the centre of Xi’an. A modern hotel with large room situated in a complex of hotels and entertainment venues. It is easy to walk anywhere inside the wall. There is a taxi stand closeby to take you outside the wall. I would stay there again if you are to ask me. I would pick any café you see that looks interesting. You can eat at the hotel but why not be adventurous. There are also the usual US fast food places. 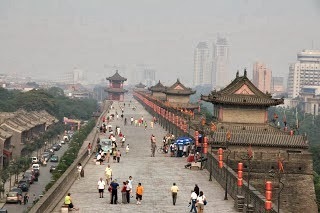 The City Itself – Xi’an is one of the 4 ancient capital cities and is enclosed inside a wall. The city inside the wall is small enough to walk around. So, if you are up to it, you won’t need a taxi. The city is clean and the air was clean while I was there. Take a bicycle ride around the wall and walk around the city. There are many sites to see. 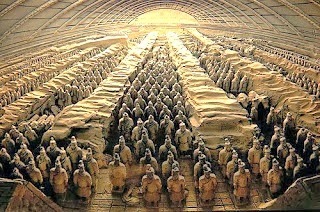 Terracotta Warriors – Qin Shi Huang was the first emperor to unite China. You don’t do this without making enemies and Qin made a lot of enemies. Qin felt that after he died he would need an army to protect him. For that reason he started to build an army of terracotta warriors, chariots, horses, everything a powerful army would need. He housed this army outside of Xi’an. It is a form of funeral art buried with the emperor in 210–209 BC and whose purpose was to protect the emperor in his afterlife. When Qin died, the people were so mad at his rule that they invaded the house of his army and set it on fire. The timbers collapsed and the army was buried and forgotten until recently (1974) when a farmer was digging a well and brought up clay artifacts. The Chinese government started excavating and found the Terracotta Warriors that you see today. There are 4 main pits containing the army. Now, there is a museum enclosing the pits and you can view the pits from above. Only a few people are allowed inside the pits. Bill and Hillary Clinton were the ones allowed in the pits. The Terracotta Warriors and the Tomb are a must see. The Tomb of Emperor Qin Shi Huang – Qin also built himself a massive tomb. It looks like a pyramid covered in dirt and vegetation growing on top of it. It is supposed to be spectacular inside but we may never know. Inside the tomb are lakes and rivers of mercury and it is too toxic to open up. The Silk Road – At the train station in Shanghai, I met a husband and wife from Australia who were travelling to Xi’an by way of Beijing and had the same idea of travelling by night. I saw them at the train station in Beijing and also at the Terracotta Warriors. They had a vacation planned that would start in Xi’an and tour the Silk Road from Xi’an to Europe. What an adventure that would be and maybe it is a future trip. All those countries you would see that end in -stan and were founded by Genghis Khan. Xi’an is at the eastern end of the Silk Road. Inside the wall is a well that could supply the entire population in case of siege. Caravans starting on their journey west would fill their water containers from the well. What a sight that must have been. There are monuments around the city for the Silk Road. 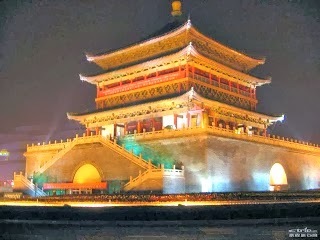 Bell and Drum Towers – In the centre of the city are the Drum and Bell Towers. They are about a block apart from each other. Take a tour of each one. The architecture of both is beautiful and both are in great condition. Fragrant Springs Park – In 1936 as Japan was invading China, Chiang Kai Shek and some of his senior advisors travelled to Xi’an. Chiang Kai Shek controlled the army. Some wanted him to join his army with the communist party to fight the invading Japanese army. He felt that he must unite China first before fending off the Japanese as he felt his army wasn’t strong enough. To do this, he must defeat the communist party and also other war lords. When the communist party couldn’t convince him to fight with them, they tried to have him arrested. He fled and was captured in a cave in what is now Fragrant Springs Park. After his capture, he was forced to fight with the communists against the Japanese. The cave where he was captured now has a monument and the park seems to be dedicated to the struggle against the Japanese. 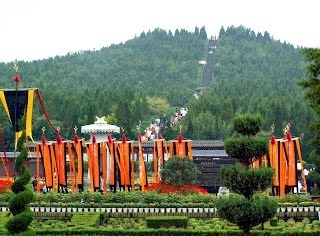 It has beautiful walking trails in the park which is in the hills and mountains outside Xi’an. One thing I found interesting was the equipment on display was mostly from the USA. I saw jeeps, tanks and even an airplane from the USA. The park is outside the city walls between the city and The Terracotta Warriors. Silk factories – You are at the beginning of the Silk Road. Try out one of the many silk factories. The taxi driver will help you get a discount. They all seem to have their favourite factory. You can walk the city inside the wall. For treks outside the wall, there are numerous taxis. Just make sure you have your hotel and destinations printed out in Chinese and English. The rail station is just outside the wall. Do you want to know more about China? As always, I am ready to answer your questions about China and Xi'an in particular. You may comment and ask questions at the end of my travel story. I am also inviting you to visit my website, www.popsipedia.com for more information on my journey. Drop me some lines.